Using the non-commercial PS3 Media Server and VLC. Tablets and smartphones are great for watching movies and listening to music, but limited by storage space. There's Gigs of music and video on my Windows 10 laptop and much less space on my Android devices. I'm getting too lazy to keep copying files across and deleting them when I'm done. Logical solution: stream from Windows to Android. However, existing internet articles would have you think setting it up is frustrating. I'm looking at you, PS3 Media Server FAQ. Good thing it's gotten much easier since those articles were written, so I'm writing this - a review more than a guide - to let you know how easy it is. Download PS3 Media Server from the link above, and install it. On first startup, you'll see a screen like this. 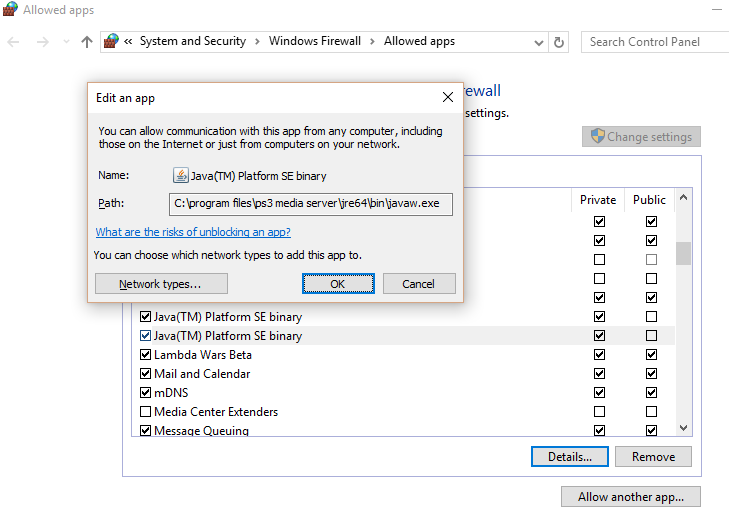 Soon, a window may appear asking you if you want to let a new program through your firewall. I assume you're only using the built-in Windows firewall. Answer 'yes', for home networks only. In the 'Navigation/Share Settings' tab, specify the shared folder(s) your media is in. Save and restart the server. You'll need to give it some time to crawl through the files, so let's move on to setting up VLC. There are many free media player apps on the play store, but VLC is a brand that you probably already know and trust. Plus, no ads. Install VLC from the Play store (link above). Note: do not install the Beta as it cannot browse uPnP shares. 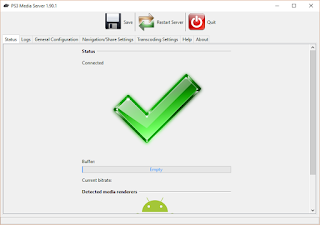 Make sure your Android device is on the same network as the PS3 Media Server. Run VLC, Open the menu, and tap on 'Local Network'. After a few seconds, VLC should discover the PS3 Media Server. PCs throw out quite a bit of heat, so this is a winter solution. During summer, I prefer copying files to the device, then turning the PC off. Streaming across the internet will need more configuration of PS3 Media Server and your router. However, I dislike exposing my home network so I won't cover it here. 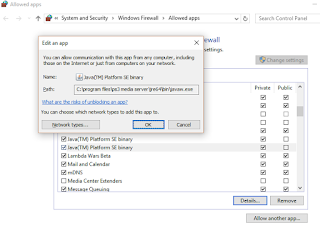 If I need to access my media remotely, I'll either copy files to device storage, or put them in cloud share (so that the NSA can enjoy them too). PS3 Media Server uses the uPnP/DLNA standard. You can stream to other devices like iOS tablets, phones, smart TVs, other PCs, and, yes, PS3s. Tweak PS3 Media Server to better suit your network by changing transcoding and streaming settings. PS3 Media Server can be configured to serve additional content, e.g. from other streaming services. 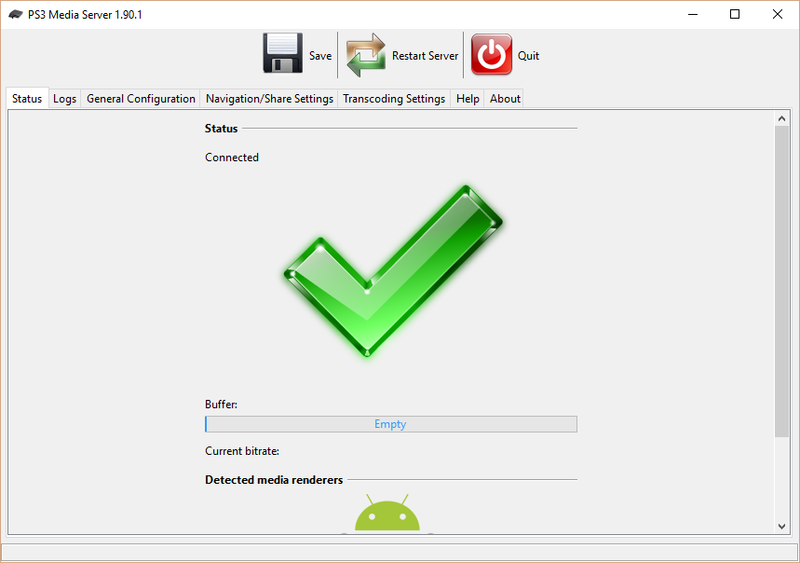 VLC makes a great primary media player for Android. Windows Media Player - I tried this. It's slow and unreliable in part because it tries to re-organise your media libraries unnecessarily. Thumbs down. Plex - it seems very powerful, but I prefer non-commercial solutions. Would have given this a go had PS3 Media Server/VLC not worked so swimmingly.